ADRI.V decided to take the term to the 21st century and call it “ The Talented Ten”. This group of women is a class of leaders, 10 Go Getta GI.R.L.S (Gifted Intelligent Relentless Leader’S) who are making things happen against the odds, blazing your own trail, not giving up and turning a dream into reality all while encouraging others to do the same. 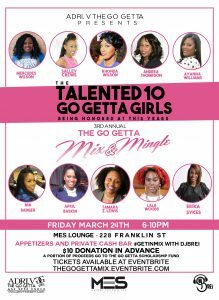 The Go Getta Mix & Mingle is a Party with a Purpose. 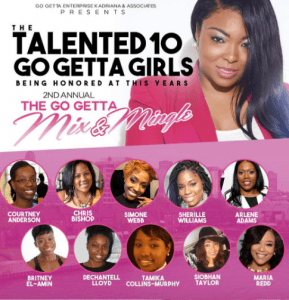 ADRI.V The Go Getta honors and Salute 10 Talented women for their achievements and accomplishments in their perspective fields during the month of March in honor of women history month. 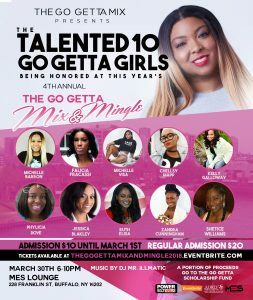 The Go Getta Mix & Mingle Annual awards event is a fundraiser for The Go Getta Girls Scholarship where all proceeds go to The Go Getta Girls Scholarship.